These buildings were wrecked by Usu’s latest eruption in 2000. They now provide visitors with first-hand evidence of the volcano’s power. 110,000 years ago, a giant volcanic explosion shook Japan’s northern island of Hokkaido. A flow of super-heated gases and rock destroyed huge tracts of forest and reached as far as the Sea of Japan coast on the opposite side of the country. 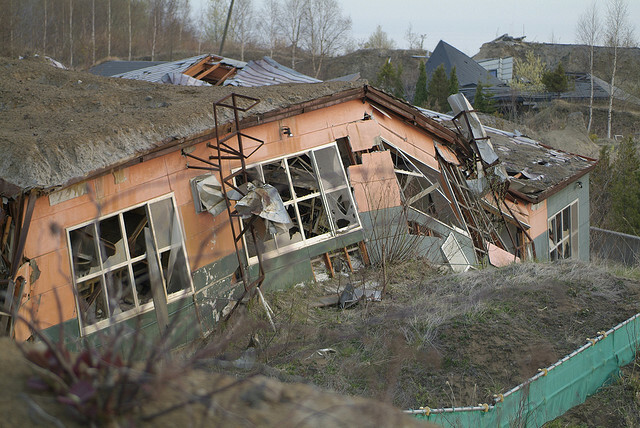 The immediately surrounding area was buried more than ten metres deep in sediment, and ash from the explosion can still be found all over Hokkaido and the northern parts of the mainland. 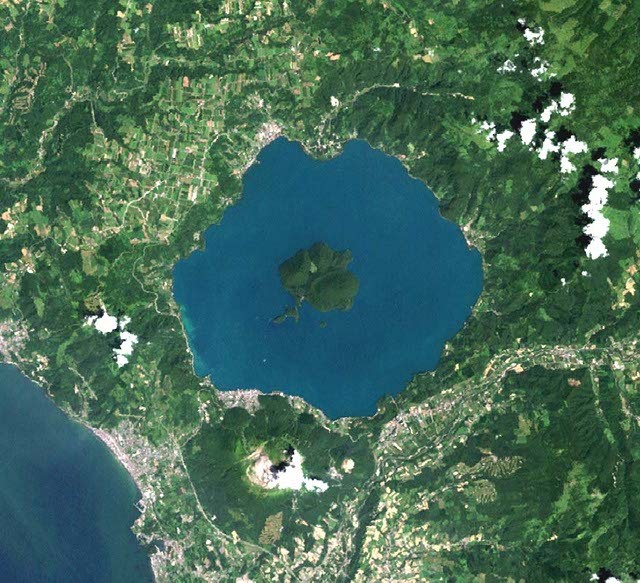 The eruption left behind a vast crater that filled up with water to form the ten-kilometre-wide Lake Toya. This wasn’t the end of the story by any means. A series of eruptions around 50,000 years ago created the Nakajima Lava Domes that now form an island at the centre of the lake. Then, around 20,000 years ago, the present-day volcano, Mount Usu came into existence. The original eruption produced a neat cone-shaped volcano, much like Mount Fuji, but further eruptions around 7,000 to 8,000 years ago destabilised the mountain, and it collapsed in an avalanche of debris. What remained of Usu then went to sleep for over 7,000 years, but in 1663 it woke up. Since then, eruptions have occurred every few decades, often throwing out massive amounts of ash and stone, and radically reshaping the mountain. An eruption in 1910 produced hot springs at the northern foot of Usu, right by Lake Toya. These now form the basis of Toyako Onsen, a large and very popular hot spring resort with several big luxury hotels. The next eruption in 1944 and 1945 created a new mountain at the foot of Usu in what was previously a flat wheat field. This mountain was named Showa-shinzan, meaning ‘Showa [the name of the emperor at the time] new mountain’. Now it’s a rocky lava dome of reddish rock, which still sends out clouds of sulphurous steam. 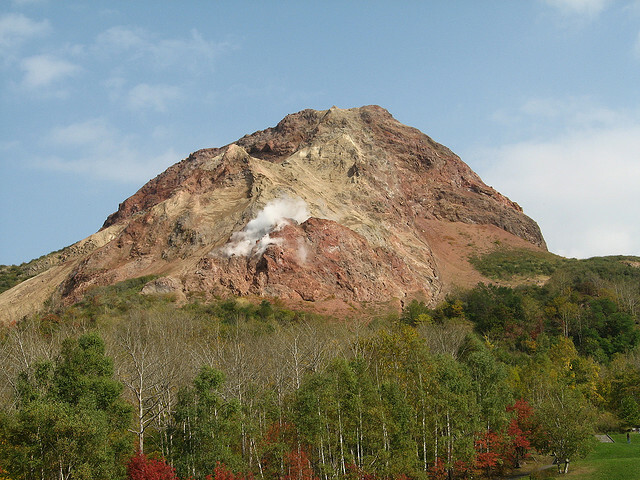 Originally Showa-shinzan was 407 metres high, but as it cooled down it shrunk to its present height of 398 metres. Lake Toya seen from space. Nakajima Island is at the centre of the lake, and Usu (partly covered by cloud) is just below it. Showashinzan is just visible to the right of Usu, and Toyako Onsen is the town on the lakeshore at Usu’s foot. The water in the bottom-left is the Pacific Ocean, and the town on its shore is Toyako, where Toya Station is located. Usu’s most recent eruption was in 2000, and lasted for five months. It was focussed on the west side of Usu, where it created more than 60 new craters. A series of earthquakes over the four days before the eruption began gave enough warning for local people to evacuate, so thankfully there were no casualties, but there was plenty of damage to buildings and roads. Usu is unusual in that every time it erupts, it radically deforms the land around it, ripping through roads, and creating brand-new hills and valleys. A decision was made to leave the ruins from this last eruption untouched, so that visitors to Usu could witness the power of the volcano first-hand. There’s a 37km road that goes all the way around the lake and which is great for cycling (bikes can be rented from Toya Station), and which provides plenty of dramatic views of the lake and of Usu on its southern shore. If that sounds too energetic, how about bathing in one of the hot springs, many of which have great views of the lake? Even if you aren’t staying at one of the hotels, several of them will allow you to use their baths during the day for ¥500 to ¥1000, or you can just dip your feet in the footbath on the town’s promenade. This is Showashinzan, which prior to 1944 was just a flat field. Steam can be seen rising from a vent halfway down the near side. If you want to get closer to the volcanic action, ride the Usu Ropeway cable car to the top of the mountain (¥1,450 return, but you can print out a discount coupon from the website). From the gondolas and the observation platform at the top, you can look down on Lake Toya and Showa-shinzan. To get to the ropeway, take a bus from Toyako Onsen to Show-shinzan village (15 minutes, 4 per day, ¥330, no service in winter). A 1.5km (45 minute) walking trail leads from the top of the ropeway around Usu’s outer rim. On the way you pass the largest of its craters, a desolate landscape of bare rock that constantly bellows forth steam. Here you can clearly see fault lines where the volcano’s power has ripped through solid stone. If you’re keen, you can hike all the way back to Toya Station from here, but most people prefer to take the ropeway back down the mountain. A visitor centre at the bottom of the ropeway has a free ‘eruption experience room’, where you can experience the sounds and sights of an eruption, and feel the magma welling up from below ground. You can also visit the nearby Mimatsu Masao Volcano Memorial Museum (¥300), which honours the local postmaster who bought Showa-shinzan in 1946, soon after it emerged out of the earth, for ¥28,000. He was a keen amateur volcanologist, and he carefully documented the new mountain’s growth, pioneering measurement techniques that are now used worldwide. From here it’s just a short walk to where Showa-shinzan abruptly bursts out of the ground. 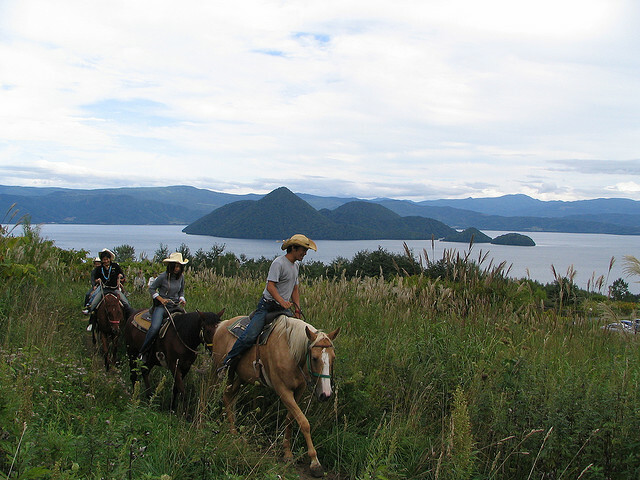 Lake Toya is a popular resort area, and one of the available activities is horse riding. This photo was taken on the west side of the lake, close to the Windsor Hotel, where world leaders gathered in 2008 for the G8 Summit. The islands are the Nakajima Lava Domes which formed around 50,000 years ago. 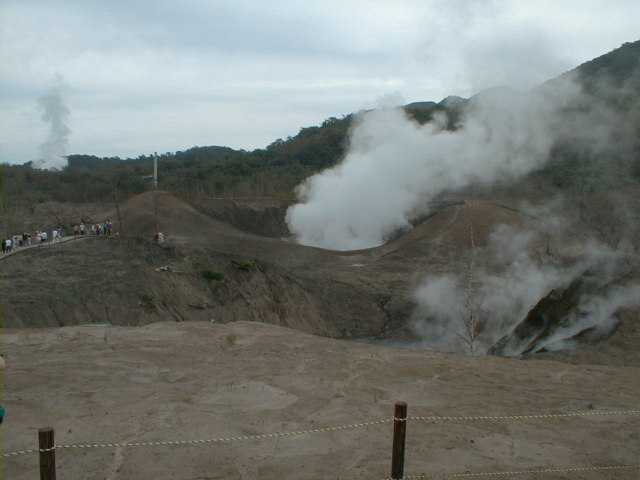 From there, the Nishiyama Crater Walking Trail leads into one of the most active volcanic zones. In places there are streetlights and road signs that no longer have a road to light or traffic to direct. Electricity and telegraph poles that were snapped in two by the force of the eruption hang suspended from the wires they used to hold aloft, alongside their broken stumps. At one point a 70 metre high hill appeared on the course of a highway that now disappears into a pond that formed at its foot. In other section the road surface has simply been ripped to pieces, and sulphurous steam hisses out from amongst vegetation at numerous points, leaving behind a crust of sulphur crystals. The biggest craters, with their bubbling-hot blue ponds, are about ten minutes walk from the car park. In places the ground is too hot to even sit down on comfortably. The shells of destroyed buildings dot the trail, which continues for another ten minutes or so to the ruins of a former kindergarten. It is here more than anywhere else that you feel in awe of the terrible power that lurks beneath your feet, but if you think this is bad, bear in mind that the previous eruption in 1977 did a lot more damage. If you want to get a view from above, you can walk up (or drive, there’s no bus) to the observatory atop Kompirayama hill (¥1,000 for up to four people), which gives a great view of the Lake and the western craters. Two of the largest craters from the 2000 eruption, and in the distance the steam rising from a third crater that’s just out of view. The area around Usu remains quite densely populated, partly because of the rich volcanic soil. The Toya-Usu Geopark website reports any warnings about volcanic activity, so it’s worth checking before you go to see if any areas are off-limits. In the case of an unexpected emergency, a system of sirens is in place to warn of the need to evacuate. The park website also has lots of useful information for visitors, including several maps and guides that you can download and print out. When planning your visit, be aware that many of the facilities around Usu, including most of the walking trails, are closed in winter due to snow (from around early November to mid April). To get to Usu by train, travel to Toya Station on the JR Muroran Line. (Toya Station is one and a half hours from Hakodate or one and three-quarter hours from Sapporo.) From Toya Station, buses run to Toyako Onsen every 30 minutes (¥320, 25 minutes). Direct buses from Sapporo to Toyako Onsen take two and three-quarter hours (¥2,700), and between April and November there are some direct buses to Toyako Onsen from Sapporo’s New Chitose Airport (two and a half hours, ¥2,140), which is served by flights from all over Japan.